The role that the payment terminal plays in the PCI-validated Point-to-Point Encryption (P2PE) process is crucial. The terminal is the first point of interaction (POI) with the credit or debit card – which is why you might hear or see the term “POI device” when a PCI P2PE solution is discussed. What sets a PCI-validated P2PE device apart from non-validated devices include the methods required to encrypt data, the tamper-resistance/responsiveness of the device, and the key injection of the devices. What sets validated devices apart from non-validated devices – aside from the fact that the devices must go through a rigorous review and certification process by PCI in order to be listed as PCI-validated P2PE devices – is that they encrypt payment data immediately upon swipe or dip, which prevents non-encrypted information from residing in the payment environment, even for one millisecond. Think about that in the scheme of data breaches. A common tactic hackers use to steal credit card data is through point of sale (POS) memory-scraping malware, also called POS RAM scrapers. In a nutshell, POS RAM scrapers steal payment data from the RAM of POS systems. RAM scraper malware can reside on the payment terminal, finding clear-text card data in the milliseconds it takes a non-validated solution to encrypt the data, or it can be found in the RAM of the terminal. Also, PCI-validated P2PE devices must have active tamper detection mechanisms to meet the physical security requirements of PCI PTS – which means that if malicious activity is detected, the device is automatically deactivated, preventing a breach at the POI device. 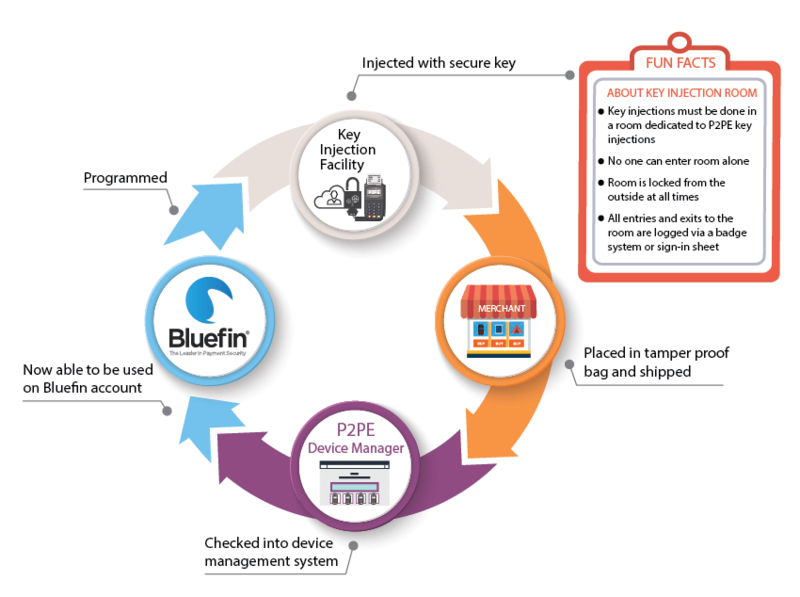 In addition to additional devices and applications, we also added several new Key Injection Facilities (KIFs) as part of our P2PE Component Provider list, including Secure Retail Limited and the Verifone KIF, bringing our total partner KIFs to 7. We recently celebrated our 4-year anniversary of PCI P2PE validation in March and we are excited that *most* of the industry now knows what P2PE stands for. It has taken a lot of education on the part of PCI, vendors like Bluefin, industry organizations, device manufacturers, and more for merchants and enterprises to understand the true value of a PCI-validated P2PE solution. And now that the understanding is there, we see the industry moving more toward solutions that provide merchants and partners a “plug and play” approach to P2PE, where networks of providers and supporters will accompany PCI-validated P2PE solutions. 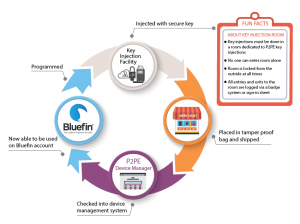 Today, Bluefin’s Decryptx® partner network includes more than 70 processors, gateways and software providers, meaning that each of these companies offers Bluefin’s PCI P2PE solution through their own gateway, software or platform – making Bluefin’s PCI P2PE solution accessible to over 2M merchants in 24 countries. And now, with 28 devices and 7 KIFs, we are looking forward to taking P2PE to a global network level. For more information on our P2PE solution, contact us.